The oldest Chinese-language newspaper in circulation is closing dozens of bureaus across China and laying off scores of staff. Chinese netizens rejoiced at the news, and analysts say the winding down of the Hong Kong-based paper is the consequence of a fierce factional struggle in the Chinese Communist Party. A total of 21 Ta Kung Pao offices in mainland China, including in Beijing, Shanghai, Shenzhen, and Fujian, will be shut, and the contracts of staff terminated, according to a notice from the company on Oct. 30 leaked on Chinese microblogging site Sina Weibo. The paper’s businesses on mainland China will cease by the end of the year, the notice continued. About a 100 staff will be fired, according to Apple Daily, a Hong Kong broadsheet, citing internal sources. A Ta Kung Pao staff later told Hong Kong media that the move was merely “normal business restructuring,” and declined to comment further. Previous reports in Hong Kong media had said that Ta Kung Pao might merge with Wen Wei Po, another Hong Kong publication. 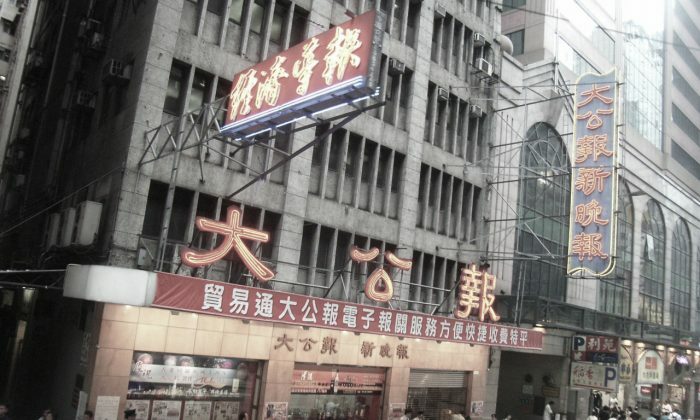 Ta Kung Pao was founded in the northeastern city of Tianjin in 1902, and the paper originally vowed never to align with political parties, governments, businesses, or individuals. Both Ta Kung Pao and Wen Wei Po, however, are presently controlled by the Liaison Office, the Chinese regime’s official presence in Hong Kong. “Even though Ta Kung Pao and Wen Wei Po are distributed free, nobody wants to read them. They are just regime mouthpieces, so it’s little wonder that the people of Hong Kong don’t respect them,” wrote a netizen from Shenzhen, a city in mainland China just north of the Hong Kong border. Analysts say the Party is merging the two pro-Beijing newspapers to save resources. Placing an ad in those newspaper is “like throwing money into water—you won’t get any customers,” Cai also said. The bulk of advertisements in Ta Kung Pao and Wen Wei Po are either political in nature or from companies linked to the Communist Party. Both papers currently receive direct funding from the Party. In 2014, the Liaison Office gave each $12.9 million, according to a report in the Hong Kong Economic Journal. Other analysts say the closing of Ta Kung Pao is part of Party leader Xi Jinping’s attempt to root out a political faction led by his predecessor, former Party boss Jiang Zemin. Ta Kung Pao is believed to be allied with the Jiang faction because it promoted disgraced Chongqing chief Bo Xilai’s political campaigns when he was in power. In 2012, the paper hosted in Hong Kong a performance of “red songs”—tunes praising the Party and Chairman Mao Zedong that the Chinese people were made to sing during the tumultuous Cultural Revolution. Jiang Zaizhong, the former head of Ta Kung Pao, attended every performance, and claimed he had “fresh feelings and understandings after every performance.” Bo had started the “red song” campaign in Chongqing to advance his political ambitions. The following year, Ta Kung Pao wove a threatening political message into a fabricated story featuring Xi Jinping. Party mouthpiece Xinhua News Agency hastily demanded its retraction, but not before it was picked up by Chinese netizens and overseas Chinese publications. By forcing Ta Kung Pao and Wen Wei Po to merge, “Xi could then effectively control these media, and the opposing faction cannot use them to attack him,” Hua Bo, a Beijing-based political analyst, told NTD. The violent protesters opposing Occupy Central who have assaulted students and sexually harassed female protesters have ties to Beijing, according to Hongkongers observing the action. Assert authority. That's Ming Pao chief editor's idea of damage control after his last- minute decision to swap a main story angered his staff.